Although manufacturers stopped producing asbestos siding in the 1970s due to health concerns, you may still find it on some older buildings and homes. Asbestos are fibrous minerals that contain thin, long fibers, which occur naturally. If the fibers become airborne, they could pose a health hazard for people around. For this reason, it's important to know what asbestos siding looks like and how to identify it. These steps will help with the identification process. Look for siding that looks like roof shingles. It is usually brittle, and the back may be black and have the appearance of tar paper. The front may have a grainy, sandy texture. Asbestos siding was manufactured to resemble many materials so it won't always look the same. 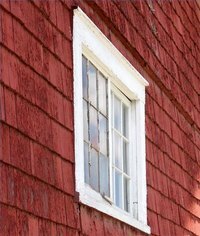 Consider the possibility of the siding containing asbestos if it is old and has a wood grain texture like cedar. The shingles are about 12 by 24 inches. The bottom often has a wave like pattern (this is the most common pattern), although this isn't always the case. Keep in mind that the only way to know for sure whether the siding contains asbestos is to have it tested. Manufacturers made asbestos-containing products to resemble asbestos-free products. You can't always determine whether a type of siding contains asbestos by its appearance. Send a sample of the siding to a lab if you suspect that it may contain asbestos. An example of this type of lab is LA Testing. Mail your sample to LA Testing, 159 Pasadena Avenue, South Pasadena, CA 91030. State laws vary regarding the removing and handling of materials containing asbestos. If you suspect that your siding contains asbestos, check the laws for your state. Don't disturb asbestos fibers by sweeping, dusting or vacuuming. Use a wet mop to remove any debris that may contain asbestos. Preferably, allow trained professionals to remove the debris.